lifetime warranty on all wood flooring & Refinishing! The longevity of your hardwood flooring is dependent on how you maintain it. Caring for hardwood floors is easy, which is why many people prefer it over other kinds of flooring. 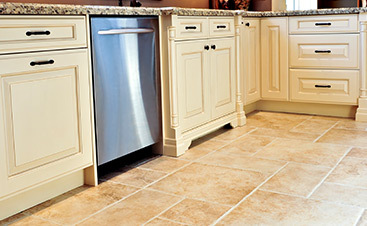 Proper care of your flooring also ensures that your investment is safe and worth it. 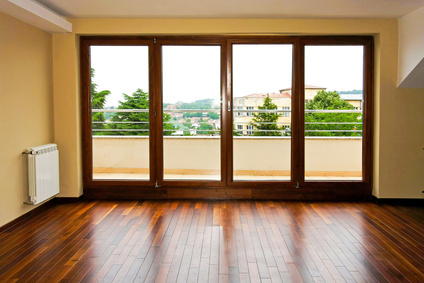 So here are a few ways in which you can maintain your hardwood floors as good as new. The kind of cleaning materials used for cleaning hardwood floors vary based on the make and finish of the flooring. Therefore it is important for you to remember the manufacturer instructions about the kind of materials that should and should not be used for maintaining the floors. Using the wrong kind of cleaning agents can damage the flooring and lead to repairs or even replacement of the flooring, which can prove to be expensive. 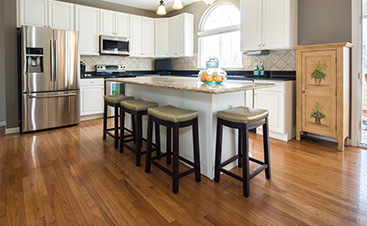 A common mistake that homeowners make is to clean their hardwood floors using water. Wood and water are not entirely compatible, which is why use of too much water must be avoided for cleaning your floors. Water, along with other cleaning agents containing ammonia and waxing or polishing agents can permanently damage the floors, and must be avoided. The items you place on the floors and how you move them around can also result in damage. Avoid dragging furniture, using pointed heels or other footwear that can cause scratches on the floor. Also use mats to prevent your pet cat or dog from scratching or chipping the floor. Use coasters for cups and glasses to avoid leaving marks on the floor. 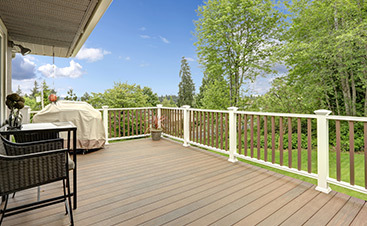 Wood, when overly exposed to water, heat and sunlight, can get discolored and even weak. So make sure that the heat and light from outside does not cause damage to the flooring by using curtains where required. Also have necessary shades on windows to prevent rain water from seeping into the home and on the floor. Too much heat or moisture can also make the flooring weaker and jeopardize the safety of those walking on it. Vacuuming is the right way to clean your hardwood floors and not using a mop or cloth. Vacuum enables you to draw out the dust and other waste from the floor without leaving any moisture, scratches on the floor. If you wish to use mats, use cloth mats or rugs instead of rubber or vinyl mats that hold water under them and create moist floors. ©2018 FlorTec - Do not copy. All rights reserved.